← Is it Too Late or is it Right on Time? Okay… I’m thrilled to be the first commenter here! This post describes our life exactly. And, yes, my daughter eats salad. My son would not touch a vegetable if it had a hundred dollar bill pinned to it. He eats Oreo cake. I am going to buy some cans of V8 Juice this afternoon. I think you’ve created a great solution… harkening back to those books on toddlers… offer a limited choice between two positive outcomes to create the illusion the kid’s in control! I love it! LOL!!! So it IS a gender issue! I’m crying to hear your daughter eats salad. I wish I could feel that parental victory, but I have three boys. The dream will never be mine. Glad to share my secrets of success with you 🙂 Please let me know how it works out. And very glad to also have you as my first commenter!! What I love about the whole vegetable dilemma, is that there is always one parent who boasts that her child eats spinach for breakfast or insists on broccoli for movie snacks or is growing asparagus in a greenhouse they built themselves. It doesn’t matter if they’re just relaying information – it all sounds like boasting to me. Really? Well, my kid can inhale Twizzlers like they’re oxygen. So there. On a positive note, things we’ve been “introducing” to her for years are finally starting to take hold. When I say introducing, I mean threatening her until she begrudgingly eats a bite while she makes regurgitation noises and a pained face.So much drama! Hang in there! Ugh! Glad to hear your story. Congrats on getting her to finally eat a bite! How many vitamins was that, did you calculate? LOL… I can’t imagine bringing broccoli for a movie snack. That is just twisted and cruel and an immediate set up for teenage rebellion, in my opinion. Thanks for sharing your thoughts! My daughter, at 16, has finally begun to eat salad. And a vegetable or two. I think it was peer pressure. Whatever it was, it took a long time. Hang in there. Yay! She’s eating salad! There is a light at the end of the tunnel. Peer pressure results in healthier food choices. Now that is something you don’t see on the news. Congratulations to you both! I can add one more to the list – my son eats corn and green beans. Occasionally he’ll eat peas but that’s a rare occasion. For some reason, I don’t have problems with him eating fruit so sometimes he’ll get fruit with his dinner. Funny thing is, I eat most vegetables but my sister, at 46, will only eat corn and the stuff that goes into salads like lettuce and tomatoes. She still won’t eat her veggies. I like that applesauce is considered a vegetable. We buy it with no added sugar, so it really is just a piece of mushed up fruit. Good to know you can grow up and be healthy without eating many vegetables. It gives me hope! Thanks for sharing your story! This is hilarious and I can so relate! Two boys here, and like you, was ALWAYS so proud when they gobbled the goop that came out of the jars. So much so that I actually was told by the pediatrician to stop with the orange veggies cause my youngest was developing a ‘tinge of an orange cast to his skin’. Alas, when they were old enough to distinguish COLORS is when the veggie devouring delight left the building. NOTHING green (seriously mom, it’s GREEN), NOTHING orange (seriously son, you used to BE orange), and God forbid, NOTHING purple (mom, nothing NATURAL is purple!). So for myself, I always attributed their sudden dislike of these ‘nasty but necessary’ side dishes to color and not taste or texture. To attest….they are both grown men now who DEVOUR the veggies once again. ps) I laughed so hard at the veggie ‘list’ and the crack about the cabinet door gnawing child. Absolutely hilarious! Thanks for tickling the funny bone! Ha Ha Ha…I’m becoming more and more convinced it is a gender issue! Boys eat whatever they want and could care less about nutrition. My guys also had the orange cast…I’d forgotten about that! Thanks for reminding me of a side effect of healthy eating! Glad to hear your kids are now eating well. Thanks for your comments, and sharing your stories. Thanks, also for stopping by! O.K., I have never seen the movie “Network”. I laughed so hard I cried – a perfect clip for your story! It is also something that I think most of us parents can relate too. My kids used to eat tomatoes from our garden until their cousin visited us and turned her nose up and said, “Eww!” when I asked her if she’d like a slice of tomato. From that day forward, my kids said, “Eww!” to tomatoes. Yep, I was mad as hell! LOL…Network is an AMAZINGLY famous movie from the 1970’s. The acting is incredible, the story plotting is timeless. Please watch it if you like a real thrilling, unique drama. It recieved many awards and much critical acclaim. And, of course, now it is helping me with my picky eaters 😉 Glad you enjoyed the post. Thanks for stopping by! I’ve seen the fruit/vege combo. My kids have tried it before and liked it. It is quite expensive, but I guess worth it if the kids are getting their vitamins. I’ll have to shop around to see what I can find. It seems to be my only hope at this point! Thanks for your comments. I’d eat my breakfast if it came to that or V8. 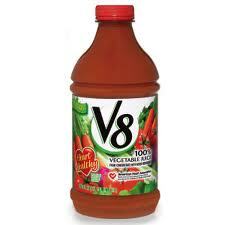 I hate V8. I don’t understand how anyone can like it. It is an aquired taste. My mom always drank it. I think I first started liking it in my teen years when I was more health conscious for the first time. It definitely takes getting used too….and rarely creates cravings for it! You are not alone…my kids don’t eat veggies either. It is a constant battle. I have a friend who disguises her kids’ food with vegetables, but I’ve never been organized enough to pull that off! She sneaks them in. Yeah, I’ve heard about the fancy cook books that have you puree zucchini and spinach and bake brownies with them. I think that is a trust issue, personally. If my kids think I’m sneakily giving them foods they don’t like I’m afraid they’ll be suspicious of any meal I prepare! Good that your friend can do it successfully,though. Yeah, it probably wouldn’t work with me either. My kids would be on to me, “Mom, this tastes funny…” I don’t bother! We’re Flintstones vitamins family too — anything I can do to supplement the vats of chocolate milk my kids’ consume. What’s worse is that my girls are picky even about their vitamins. They never eat the purple ones, just the orange and pink ones. Picky to the extreme, I tell ya. Have you tried Ovaltine? It’s chocolate milk that’s vitamin enriched! I’ve had my kids drink that before. The Nestle Quick is just sugar. LOL…I can’t believe they don’t like the purple ones. They are number two favorite in our house…following orange. They always put too many red ones in the jar! Yeah, they like them. I find the a little sour, personally. I’ve seen the gummy ones…so much more expensive! BUT THEY REALLY TASTE LIKE CANDY…. Ok ok ok. I’m actually a little excited when it’s time to eat them. LOL – literally! At our house, my son will eat anything I tell him, it’s the girl who is picky. PLEASE keep writing. You have talent! Hey friend! Thanks for stopping by my blog on several occasions. Your particular brand of writing is so crisp and humorous and I’ve really enjoyed reading your posts, too. As such, I thought I would toss a “Beautiful Blogger” nod over your way — if you’d like to accept, head over to my post http://calundmark.wordpress.com/2012/10/19/am-i-blushing/ for the details! I love that they like their veggies; candy corn and jelly beans! That’s a hoot. My kiddos grew up not eating the healthiest of foods. And now they are blest with children who are refusing to eat the healthy foods that they, as parents, are trying to feed them!! Ha Ha! Payback. I’ll have to tell my kids about that one! Good plan of using the V8 juice! My children also believe that corn chips are vegetables. Candy corns and jellybeans – hilarious! My nephew eats salad, and I often wonder why my dudes won’t eat salad. Maybe because it is, as they say, gross. Who knows! LOL! A typical kid’s review of vegetables: “Gross!” Thanks for stopping by! Ha ha. Nice plan. I’ve always loved vegetables! I used to pretend my broccoli was a tree and that I was a giraffe when I was a kid. I’d also have food eating contests with my brothers. The part about candy corn and jelly beans made me laugh. Good luck with your kids and their veggies. Glad you enjoyed this! Sadly, there is little hope for my kids and their veggies….lol!! That is awesome! I’ve tried to get my kids to use their imagination with their vegetables, but it only works so far. Thanks for stopping by! Yes, I would think even I (as a parent and vegetable advocate!) would have a problem eating cold broccoli. Funny how temperature makes such a difference. Thanks for stopping by!